This command scans the current stream and locates all text strings. and whitespace (Space and Tab) characters that has the length in the specified range. You can specify your own valid character set to narrow the search. For example, if you want to find all people names in the file, check the box Custom character set and remove all characters except letters. Use C-style escape sequences to represent non-printing characters. Note however that the zero character has special meaning in strings and cannot be specified as a part of the set. By default, the command searches only for null-terminated strings, rejecting character sequences terminated by other non-printing characters. 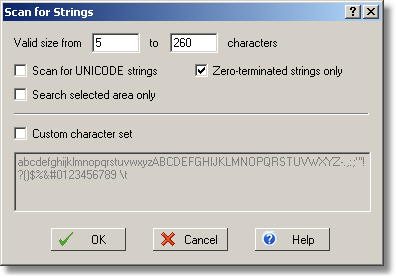 If you uncheck the Zero-terminated strings only box, the command will find all strings terminated by characters not included in the allowed character set. The strings found (if any) will be listed in the String Pane.